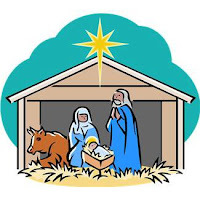 "" Writer's Wanderings: Will The Christ Child Come? One Christmas we had an interesting experience that I would like to share. Halfway through December we were doing the regular evening things when there was a knock at the door. We opened it to find a small package with a beautiful ceramic lamb inside. We looked at the calendar and realized that the 12 days of Christmas were beginning! We waited excitedly for the next night's surprise and only then, with the gift of a matching shepherd, did we realized that the lamb was part of a nativity set. Each night we grew more excited to see what piece we would receive. Each was exquisitely beautiful. The kids kept trying to catch the givers as we slowing built the scene at the manager and began to focus on Christ's birth. On Christmas Eve, all the pieces were in place, but the baby Jesus. My 12 year-old son really wanted to catch our benefactors and began to devise all kinds of ways to trap them. He ate his dinner in the mini-van watching and waiting, but no one came. Finally we called him in to go through our family's Christmas Eve traditions. But before the kids went to bed we checked the front step -- No Baby Jesus! We began to worry that my son had scared them off. My husband suggested that maybe they dropped the Jesus and there wouldn't be anything coming. Somehow something was missing that Christmas Eve. There was a feeling that things weren't complete. The kids went to bed and I put out Christmas, but before I went to bed I again checked to see if the Jesus had come -- no, the doorstep was empty. In our family the kids can open their stockings when they want to, but they have to wait to open any presents until Dad wakes up. So one by one they woke up very early and I also woke up to watch them. Even before they opened their stockings, each child checked to see if perhaps during the night the baby Jesus had come. Missing that piece of the set seemed to have an odd effect. At least it changed my focus. I knew there were presents under the tree for me and I was excited to watch the children open their gifts, but first on my mind was the feeling of waiting for the ceramic Christ Child. We had opened just about all of the presents when one of the children found one more for me buried deep beneath the limbs of the tree. He handed me a small package from my former visiting teaching companion. This sister was somewhat less-active in the church. I had been her visiting teacher for a couple of years and then, when she was asked to be a visiting teacher, she requested to go with me. I had learned over time they didn't have much for Christmas, so that their focus was the children. It sounded like she didn't get many gifts to open, so I had always given her a small package--new dish towels, the next year's Relief Society lesson manual--not much, but something for her to open. I was touched when at Church on the day before Christmas, she had given me this small package, saying it was just a token of her love and appreciation. As I took off the bow, I remembered my friendship with her and was filled with gratitude for knowing her and for her kindness and sacrifice In this year giving me a gift. But as the paper fell away, I began to tremble and cry. There in the small brown box was the baby Jesus. He had come! I realized on that Christmas Day that Christ will come into our lives in ways that we don't expect. The spirit of Christ comes into our hearts as we serve one another. We had waited and watched for him to come, expecting the dramatic "knock at the door and scurrying of feet" but he came in a small, simple package that represented service friendship, gratitude, and love. This experience taught me that the beginning of the true spirit of Christmas comes as we open our hearts and actively focus on the Savior. But we will most likely find him in the small and simple acts of love, friendship and service that we give to each other. This Christmas I want to feel again the joy of knowing that Christ is in our home. I want to focus on loving and serving. More than that I want to open my heart to him all year that I may see him again.